Having not been really familiar with powerhouse vocal group Veritas, until their signing to Fair Trade Services earlier this year; the 5 piece acapella/gospel group, comprising of Jeff Anderson, James Berrian, Andrew Goodwin, Jordan Johnson, and Lucas Scott Lawrence, all shine on their self-titled label debut which released in September last year. Though I wouldn’t normally listen to, let alone review acapella/vocal groups similar to gospel or opera-style, it was a familiar few pop/CCM tunes that piqued my interest- songs from MercyMe, Switchfoot, Michael W. Smith and Matt Redman covered by this unique group deserved a listen. So what is my assessment of these 10 songs sung in a genre I do not normally listen to? Well it’s definitely different that’s for sure, and in a good way, leaving me more educated and appreciated of music in general. 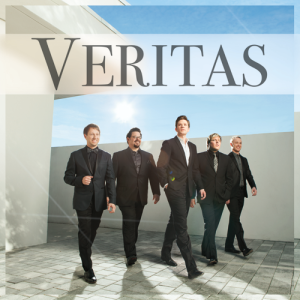 Well done Veritas for delivering songs that will be on rotation for a while on iTunes! First of all, let me say that the album for me is delivered to perfection and professionalism overall, despite the clear cut ‘groups’ of the songs, the CCM covers, the original songs and the musical/theatre production covers. Though it was the 4 CCM smash hits that drew me in, the originals are equally compelling and powerful. “I Can Only Imagine”, “Dare You To Move”, “Agnus Dei” and “10 000 Reasons” are all covered brilliantly, with plenty of synth and strings at the forefront while the 5 singers all sing beautifully and exquisitely in harmony together! And with Jeff, James, Andrew, Jordan and Lucas also unveiling an American Anthology (a medley of melodies about America), John Legend’s “If You’re Out There”, “The Lord’s Prayer” and “You’ll Never Walk Alone” from the Rogers & Hammerstein musical Carousel, there’s definitely something for everyone musically and lyrically in the vast smorgasbord of genres encompassed in these exquisitely played and performed 10 tracks. With the whole album incorporating the big orchestral epic sound that we have come to know and expect from musicals and theatre productions, the most noticeable difference for most of the tracks is the absence of the electric guitar, and the heavy feature of synth and keys, which adds a new layer and depth for some of the tracks which are immediately recognisable. With a 45 member orchestra being the foundation for the album musically, there is no greater grandiose worship anthem than the opener “Agnus Dei”. The quintet cry praises out to God, singing ‘…alleluia, alleluia, for the Lord God Almighty reigns…Holy, Holy, are You Lord God Almighty, worthy is the Lamb…’, with the song, a medley of sorts where the hymns “Mighty Fortress” and “All Hail The Power Of Jesus’ Name” also included; is worship at its best, at its most vulnerable and honest. With the song being the perfect way to start this ‘movie soundtrack’ (because that’s what these songs sound like- melodies made for the big screen! ); the mega-single “10 000 Reasons” is sung with the same intensity and passion for Jesus. Complete with superb vocals and plenty of musical instruments to create an epic orchestral feel (mainly the keys); Matt’s radio single based on Psalm 103 is very magical when sung by Veritas, and lyrically depicts all of the great things God has done for us, and all of the great things that God is as well. With all of God’s unending and perfect traits, why can’t we ‘…bless the Lord, oh my soul, oh my soul, worship His holy name; sing like never before, oh my soul…’? Switchfoot’s “Dare You To Move” is altered the most, with the 2003 single being stripped from the rock roots, and changed around to a more fuller all-encompassing big band style. As the five vocalists each remind us to run forward with our eyes fixed on the prize of Jesus, and move in the direction that He is calling us, we are given a different, yet nonetheless still powerful, rendition that should make Jon Foreman proud! And while Veritas’ version of MercyMe’s “I Can Only Imagine” is more or less similar to the extended symphonic 2009 version from Bart and co. (except for an extended instrumental bridge), as we are posed the question ‘…will I stand in Your presence, or to my knees will I fall, will I sing Hallelujah, will I be able to speak at all?…’; these 4 CCM covers to me lay the platform for me to enjoy the rest of the album, which stands tall all on its own as well, even if the others weren’t covered at all. “You’ll Never Walk Alone”, famous from the musical Carousel, was written in 1945, and been covered many times by artists and sporting teams alike across the years. Maybe I’m not cultured enough, but I haven’t heard of this song before (I originally thought that Veritas was covering Point Of Grace! ), however it still is powerful and impacting, with the vocalists describing how we won’t walk alone in this life, keeping the lyrics ambiguous so that we can all find meaning in the words regardless of our beliefs, although I know that their faith is reflected in this song especially, as there’s something about the track that makes me think that God has anointed it. “The Lord’s Prayer” is a retelling of the prayer in the Bible, led by the keys, and Veritas sing the track with such beauty and grace; making the worship anthem the perfect album ender that explicitly reminds us about what the gospel is all about, while the gigantic brass sounding “An American Anthology”- though too patriotic for my liking- is one of the best songs musically- as there are lots of keys, synth, woodwind and brass instruments, adding a new layer to the already impressive album. The final cover “If You’re Out There”, the piano led R&B melody originally sung by John Legend is lyrically the most impressive, as we are reminded about being the change we want to see in this world, and actively making a difference. While also not an explicit melody about Jesus; guaranteed lives will be changed by this open and honest song, as we are presented with questions as to who the song is directed to, while we sing ‘…if you’re out there, sing along with me if you’re out there, I’m dying to believe that you’re out there, stand up and say it loud if you’re out there…’. We know the song is about Jesus, and hopefully others will catch on soon as well! Of the ten songs, only 2 are originals, with each song captivating and enthralling as the 8 covers! “Love Of My Life” fits right at home on the album, with the melody being a ‘movie soundtrack’ or ‘theatre production’ song, as each of the 5 vocalists remind us our greatest Love of our lives, which is Jesus. I actually never thought the song was a cover, and was trying to find information on google about how many covers the song had before Veritas, for a while before I realised that it was an original song (which is very cool indeed!). But if there is one song that I would have to pick to listen to from the album, it would be “The Hand That Holds The Storm”. With Jeff, James, Andrew, Jordan and Lucas putting on their Anthem Lights hats on, it is the inspirational and encouraging subject matter that has me singing at the top of my lungs to God with gusto and zeal. As the chorus highlights that ‘…the arms that raised the heavens will lift you when you fall, the voice that shakes the mountains will answer when you call, and the skies above may open but grace will cover you, and the hand that holds the storm will lead you through…’, we are given hope in the form of Jesus that He is our refuge and safety in all times, even in the storm. Well done Veritas for a compelling and inspiring melody, and for an album that exceeded all of the expectations! “…The set list shows the diversity of what we do, and allows us to showcase the uniqueness of a sound that lets every member’s vocal talent shine. The common thread that goes through each song conveys our message and purpose and, for those who have not seen us perform, reflect what a Veritas concert sounds like. We are so happy that we made an album that everyone could enjoy, mixing brand new material and fresh adaptations of older pieces along with familiar songs done with arrangements specific to what we do as a group…” Though not knowing much about Veritas prior to August last year, now I can’t wait to hear what they have to offer this year and the year after! While you still won’t catch me voluntarily listening to opera and orchestral pieces, what Veritas’ debut album has done is widen my musical horizons so that I can appreciate songs outside of my genre without loving them more than other tracks. And so this album has me singing along with these 5 men of God, although it’s not my favourite genre. Not yet anyway (just joking! Opera/theatre will not surpass pop/rock and CCM!). In all seriousness though, check out Veritas’ new album; you will definitely be surprised in a good way!